Whether you live near the ocean, a lake, a river, or ANY body of water that rises and falls causing flooding over your property, health officials and water quality professionals all agree that well owners should take a few minutes to consider the potential hazards that may exist with drinking water after flooding events have taken place. Flooding, whether extensive or localized, may compromise water quality in drinking water wells. What if my well never got submerged by flood waters? Even though your well may not have undergone severe flooding itself, you should not assume that it will provide safe, clean drinking water. When floods occur, contaminated surface water may indirectly find its way into the aquifer (underground water source) from which your well draws its water. Under normal circumstances, surface water creeps slowly downward through the ground and as it does so it undergoes a sort of natural filtering by the elements it passes through. When floods occur, that filtration process may get bypassed altogether, as in cases where a damaged wellhead tapping into the aquifer allows contaminated surface water to shoot rapidly downward into aquifer by way of a compromised water well. Has the quality of your water changed (odor, color or taste)? Did the flood waters come close to your water source? Did your well actually get flooded? Immediately stop using the well water for human consumption and use only bottled or boiled water for things like drinking, cooking, and washing. At the very least have your well tested for coliform bacteria and should the test come back positive, definitely have your well disinfected. Then test, again, to make certain the disinfection process worked. We recently learned that the Allegan Conservation District in Allegan County (Michigan) will distribute free test kits for nitrates and nitrites to landowners from 9 a.m. to 3 p.m. on Saturday, April 23, at the Allegan County Area Technical and Education Center, 2891 116th Ave. in Allegan. This free water test kit offer comes to you courtesy of the Michigan Department of Agriculture and Rural Development through the Michigan Agriculture Environmental Assurance Program with the Allegan Conservation District. While not considered a substantial health risk in lower quantities and concentrations, as they occur naturally in many foods and get used to preserve and cure meat products, but concentrations in excess of 10 mg/L (1 mg/L = 1 part per million) in drinking water pose a health risk to young children under the age of 6 months old, expecting mothers, nursing mothers, and the elderly. Due to most water well contamination by nitrates and nitrites coming from surface runoff, shallow wells therefore stand the greatest chance of having higher than acceptable levels of nitrates and nitrites. Health officials and well water professionals typically suggest that all drinking water obtained from wells get tested annually for — at the very least — nitrates, nitrites, and coliform bacteria. Also, if you just had a new well installed, or work done on your existing water well, you should have the water tested prior to using water from the well for drinking or cooking purposes. For more information on the free water testing offer in Allegan County, Michigan, you can visit their web site www.allegancd.org or you can contact Ana at at 269-673-6940, ext. 5. We recently learned that the McHenry County Department of Health (located in Illinois) intends to offer a discounted water testing package to local homeowners with private water wells in the month of April 2016. 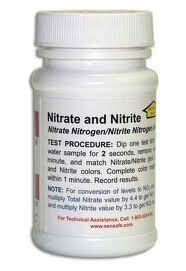 The package will include a test for coliform bacteria and nitrates for a cost of $18. Why test my well water? Many potentially harmful well water contaminants have no taste, color or odor and may enter aquifers from which drinking water wells without notice. Municipal water supplies that draw from the same aquifers as local private water wells perform regular tests on their water (as mandated by law) so any changes would get noticed and corrected immediately where as no laws mandate testing of private wells… meaning private well owners would continue using contaminated water because they did not know of water quality issues. How does well water contamination occur? Despite the fact that wells draw their water from sources hundreds or possibly thousands of feet below the Earth’s surface, any source of contamination on the Earth’s surface can eventually makes its way into our subterranean water sources. OK, so how do I get my water tested in McHenry County? First, pick up a sterile water sampling container from one of the participating locations listed below. Then, return samples for testing on Tuesdays in April between 9 AM and noon at one of the same locations. Note: We suggest collecting your sample on the same day as you intend to drop it off for testing. What if I want my water tested… but I live elsewhere? Not all discounted (or free!) water testing opportunities offered by departments of health and other agencies get publicized as much as they should so we recommend contacting your local health department directly to see what they may offer. For those interested in performing water testing on their own well or tap water, we offer a wide variety of DIY water test kits in the Water Test Kit Store. Plastic or Glass for Water Sample Collection? We received a recent inquiry from 'HollyDay' who asked, " What kind of containers should we use for collecting the water samples? i.e., plastic, glass... And should we use a different container for each sample we test?" Thank you, Holly, for asking a VERY good question. We cannot stress the importance of reading the directions of a water test, or ANY test for that matter, enough. Reviewing the procedure before starting a test helps you understand the 'big picture' of how the testing will go and allows you to make any preparations needed for the test before you begin. Some tests will require different volumes of water sample, so choose sample vessels accordingly. No need to use a gallon-sized container to collect a sample for a test that requires only 100 mL of water! Will some tests need time to 'develop' or do some of your tests require a specific geometry of sample container? As an example of the latter, the SenSafe brand of water test strips uses patented aperture technology on their test strips that allows for the detection of lower concentrations, but requires a sample container wide enough to allow the strip adequate back-and-forth motion. Glass containers can break, so if prone to dropping things -- especially wet things -- you may want to stick with plastic. Chances are you do not want shards of glass in or near your drinking water source! Choose a clean container, meaning one that does not contain 'chunks' of its previous contents stuck to the sides. Avoid using containers that previously contained products like bleach, soap, peroxide, ammonia, etc. since compounds like those may have leached into container walls -- and may creep back out into your water sample(s). Rinse the containers thoroughly with sample water prior to collecting a sample for analysis. If reusing the sample sample container for different tests, make sure you rinse the container thoroughly with sample water between tests to eliminate the risk of reagents from the previous test(s) affecting the next test. At the end of the day,when you have completed your testing, if any test results indicate a potential problem with your water, definitely have your water tested by a qualified water testing laboratory so you can find out for certain and install the correct water treatment option. Whether you have just had the well head open for inspection, you have had work done on the well or well head, flood water has recently submerged your water well, or you have decided to start using a well that has sat dormant for a period of time... you really should disinfect the well before use! Below you will find a simplified list of instructions on how to properly disinfect a drinking water well. Please keep in mind, though, that all wells have differences and no two well water situations are exactly alike. So, if this list does not provide you with enough guidance, contact your local environmental department and they can usually provide you either with more detailed instructions on their web site or the names of reputable, licensed well water professionals in your area. Pump water from the well before disinfecting allowing all sediment, debris and other visible 'junk' to flow out of the well. Leaving that stuff in the well during the disinfection process diminishes the cleansing effect of the chlorine bleach. Add unscented chlorine bleach (on other words, just plain old laundry bleach... which usually has around 5% chlorine and no added fragrances) to the well and test the water coming out of the well. You will want to add enough bleach until testing shows 50 to 100 parts per million (ppm) of bleach in the water. The chart below will give you an approximation of how much unscented laundry bleach you may need to use. Depth of Well 3 in. 6 in. 9 in. 12 in. After adding the bleach make sure you route the well's discharge water (the water produced by the well when turned on) back into the well so that the chlorine bleach mixes thoroughly in the well. Mixing should take place for at least 15 to 20 minutes. Reconnect the well's output hose to its normal connection (the one leading to the house) and open all faucets in the house individually. Once a strong chlorine odor appears, close the tap. Do this for each tap in the house. Allow the chlorinated water remain in the well and house lines for no less than 2 hours, and preferably longer if you can. The longer the chlorine stays in the lines, the better the odds of a successful well disinfection. Usually around 24 hours works well for this purpose, though some experts say letting the system stand as long as possible makes the most sense. After waiting no less than 2 hours and hopefully closer to (or longer than) 24 hours, open all taps/faucets in the house and allow the well to pump all of the chlorinated water out. This step is called flushing the system. Once the smell of chlorine has gone away, close the taps and your well should be ready for use. To confirm that the disinfection process has worked, you will want to test water from the well in about a week to see if the source of bacteria still exists down in the well. Important Note: The instructions above serve as a rough guide for how to disinfect a drinking water well. Obviously all wells have idiosyncrasies that make them unique so if the above instructions fail to take your well water situation's specifics into account, definitely err on the side of caution and seek the assistance of a trained water well professional! We believe the WaterWorks High Range Free Chlorine product works well for this application. It requires no special testing supplies, reagents or complicated test procedures and detects up to 120 parts per million free chlorine. Free chlorine versus total chlorine? When disinfecting a water well, you will normally want to test for free chlorine since a 'stable' free chlorine residual typically means a water sample no longer contains a significant number of biological contaminants. Today's inquiry came to us from 'Kyle' who asked, "We had a new well put in because our old well dried up and we were told could not be made deeper. Water from our new well tastes metally like iron but the test strips we got from a friend in the pool business tell us there is no iron. Would you iron test work better maybe?" General Metals Testing Approach -- This approach will give you a 30,000-ft view of your metal problem since several different metals may resemble the 'taste of iron' when dissolved in drinking water. We suggest using a general metals testing product such as the SenSafe Heavy Metals Check which detects a broad spectrum of dissolved heavy metals and gives a total concentration of all the metals it detects (Note: The product will not identify individual metals or tell you how much of each metal it detected in a water sample). Focusing on Iron -- If you feel certain you have iron in your water, then the WaterWorks Visual Iron Test Kit may work well for you. It differs from most iron tests in that it detects 'total iron' by converting Fe+3 iron to Fe+2 so the test reagent can detect it. Most pool test kits we have seen, unless you get into troubleshooting versions, will only detect Fe+2. Please note, however, that if your water does not contain iron at all (in either form), this test will also show blank results. Thorough (Laboratory) Well Water Analysis -- As a general rule, we believe newly dug wells should get tested for a full battery of tests before getting put into use. Companies like National Testing Laboratories offer a number of mail-in water testing packages and typically provide results in about a week to ten days. Before running off and ordering the most expensive test package possible, though, you may want to contact your local Department of the Environment and ask them what sort of well water contaminants or issues they know of in your area... and choose a testing package based on the information they provide. Once you get your iron in water and/or metals in water problem resolved, please keep one thing in mind: Many contaminants in well water -- some of them harmful -- have no associated taste, appearance or odor. 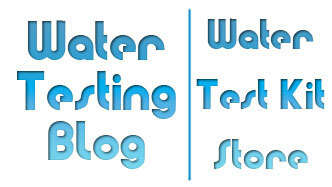 Only periodic testing of the water will let you know if a water quality aspect of your well water has changed. Recently we received an inquiry from 'Rebecca' who asked, "Hello, I was wondering if there are any test available to check for asbestos in well water? 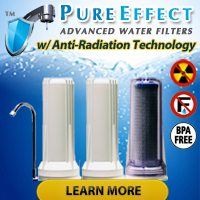 Thanks,"
At this time we do not know of an at-home water test kit for detecting asbestos levels in drinking water. Therefore suspect such testing would need to get carried out in a laboratory environment using more sophisticated testing methods. Asbestos occurs naturally in the environment as a fibrous mineral. The heat resistance capabilities of asbestos make it very useful for a number of common products such as brake pads, protective gear for people working in high heat environments, and roofing materials. You may even find asbestos impregnated in cement piping used to transport water from distribution sites to customers' homes. Asbestos contamination in water gets measured as 'fibers per liter' and the contamination action limit for asbestos in drinking water is 7 MFL (million fibers per liter). Water treatment facilities bust notify their customers if routine sampling reveals greater than 7 MFL asbestos in the water they distribute. For more detailed information on asbestos and asbestos in water, we suggest visiting the USEPA Water Web Site. Today's inquiry came to us from 'K McG' who asked, "Got well with high iron level, maybe also due to old plumbing with galvanized pipes. Droppped 2" x 12" x 3' treated wood in well. Immersed 1 mo. until fished out/removed. Have run water to dilute any leached arsenic many times. Will your arsenic test kit (5) give accurate results to determine safety for drinking water?" To our knowledge, the iron in your well water ought not cause a problem for the Arsenic Quick Test Kit. We have heard of only one common well water component that causes know interference with the Arsenic Quick line of water test kits: Hydrogen Sulfide. Arsenic Quick test kits eliminate (negate the effects of) lower amounts of hydrogen sulfide in a water sample but hydrogen sulfide levels in excess of 2 mg/L (ppm) will interfere with testing. Unsure if your water contains elevated levels of dissolved hydrogen sulfide? The WaterWorks Hydrogen Sulfide Low Range test kit detects levels from 0.3 up to 2.0 mg/L (ppm). As for which Arsenic Quick Test Kit to choose, we suggest opting for one with a wide detection range (i.e. one that starts below the EPA action level of 10ppb and can also detect levels much higher than 10ppb). For most people looking to get a general feel for how much, if any, arsenic their water contains, the original Arsenic Quick Test Kit (packaged as 2 test, 5 test and 100 test versions) works quite well. Today we heard from 'Margaret' who asked a question about well water testing: "Hello--We have a well, and I am wondering which of the test kits you would recommend. Are they pretty dependable? I would appreciate any guidance you can provide. Sincerely, Margaret"
Hello, Margaret, and thank you for your inquiry. Of all the at-home drinking water test kits that we carry, the one named SenSafe Water Quality Test Kit offers the largest different tests and its WaterWorks and SenSafe brands of included water test strips have an excellent reputation -- and are manufactured here in the United States. If you want a more complete testing of your well water, or have good reason to suspect contamination, we suggest taking a look at mail-in test kits from National Testing Laboratories. In particular, the Well-Check Water Testing Package covers a great number of the possible contaminants a person may possibly find in their well water.